I’m too busy catching up on spillover from last year, and I’m not going to have the chance to see the newly released Bullhead, Belgium’s nominee for Best Foreign Film, or Best Documentary nominee Undefeated, before the Oscars. 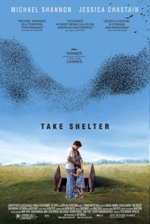 Take Shelter (highly recommended): This dramatic thriller – my #7 film of 2011 – and my features a spectacular lead performance from Michael Shannon as a man warring with his own sanity as he hallucinates visions of terrible storms. Both the script and the visual representations of his imagination are equally strong, and the film is unsettling, highly stressful, and extremely effective. The Bang Bang Club (mixed bag): This Tribeca 2011 entry isn’t as strong as last year’s “5 Days of War,” but it does present a thought-provoking examination of the responsibilities and ethics of war photography.